This panelized case was custom designed to hold rare collector's 45 RPM records. 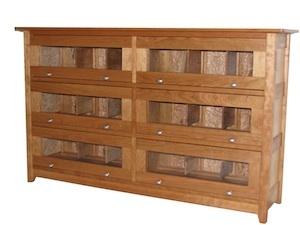 The case is based on a Barrister style bookcase with flip up glass doors (see other images by clicking on thumbnail photo). The case is made from Cherry with book matched Birdseye panels. There are Birdseye separators inside to hold and separate the records. Brass Thumb Screws are used to secure the separators. The separators can be configured to manage the record collection. The overall style of the design models my Boothbay series. The piece as show lists for $5,900. Pricing based on wood combinations. Click on photo to see other views.